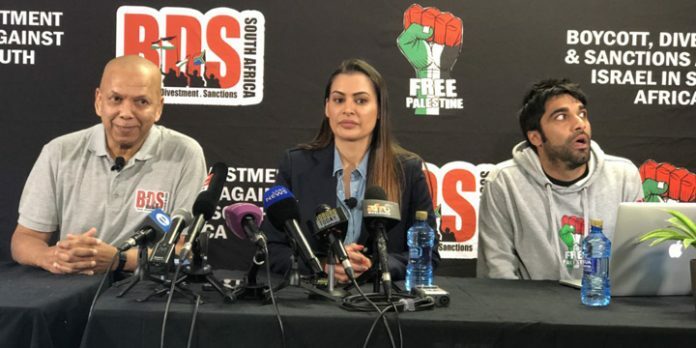 South African model Shashi Naidoo at a press conference organized by the BDS campaign on June 20, 2018. Photo: BDS South Africa. A South African model who pledged to “re-educate” herself with a visit to the Palestinian territories after she faced death threats for defending Israel said she has been barred from entering the country. Shashi Naidoo — who first announced that she would go on a “fact-finding visit to Palestine” during a press conference organized by the boycott, divestment, and sanctions (BDS) campaign in South Africa last month — said she attended a meeting at the Israeli Embassy and learned that she would be “declined access” to the country, the South Africa Jewish Report revealed on Thursday. She was expected to begin her trip on Monday. Naidoo received a torrent of online abuse and lost multiple sponsorship deals in June after she rejected accusations that Israel was an “Apartheid state” and called Gaza “a sh*thole of immense proportions” during an exchange with a follower on Instagram. According to screenshots of her now-deleted comments, the model blamed the coastal enclave’s humanitarian crisis on the ruling Islamist terrorist group Hamas, accusing it of siphoning foreign aid “to build terror tunnels and rockets,” in lieu of schools, hospitals, and other civilian infrastructure. The model subsequently lamented Israel’s decision not to allow her entry, based on a recently-passed law that prevents foreign nationals who call for boycotts of the country from entering its territory. “A BDS-planned mission such as this obviously intends to do just that,” she argued. Naidoo is not the first public figure to draw outrage in South Africa for her views on Israel. In May, radio host Gareth Cliff came under fire from social media commentator for denouncing Hamas-led riots on the Israel-Gaza border on May 14. More than 60 Palestinians were killed by Israeli troops that day, the majority of whom were claimed as members by Hamas and Palestinian Islamic Jihad. The South African government — ruled by the African National Congress (ANC) — recalled its ambassador to Israel over the incident. Next articleHumor: What Are You Wearing?